Submitted by Angarrack.info ... on Fri, 13/09/2013 - 17:04. The site is designated under policy TV-2 of the Penwith Local Plan (2004) as an Open Area Related to Settlements which forms an important and necessary break in the development between the business park and Angarrack village and enables the village to retain its separate identity. There is no evidence to show any specific demand or need for the proposed development and it is thus considered that the proposal fails to accord with policy 5 of the Cornwall Local Plan Strategic Policies 2010-2030 Pre-submission document March 2013 which indicates that employment proposals should be well integrated with existing development and where such sites are in rural locations, there should be an overriding need for its location. The proposal also conflicts with paragraphs 9 and 17 of the National Planning Policy Framework which indicate that new development should contribute to conserving and enhancing the natural environment, paragraph 19 of the National Planning Policy Framework which indicates that planning should support sustainable economic development and paragraph 111 of that document which indicates that authorities should prioritise Brownfield sites for new development. The site lies in a Critical Drainage Catchment where ground conditions are such that it is unlikely that infiltration to soakaways would be viable. Consequently the applicant proposes that surface water is to be discharged to the public sewer at a rate attenuated to Greenfield runoff rates. However, South West Water have advised that they will not allow new surface water drainage connections to their sewer and as such it is not considered that it has been adequately demonstrated that the development will not lead to increased flood-risk elsewhere. The proposal thus conflicts with policy 26 of the Cornwall Local Plan Strategic Policies 2010-2030 Pre-submission document March 2013, with paragraph 103 of the National Planning Policy Framework and policy GD-4 of the Penwith Local Plan (2004). The proposed development would be located on open undeveloped land and would create an intrusive and artificial feature in the open countryside, extending the urban form to the detriment of local character. It would not maintain a sense of place or reflect the identity of local surroundings thus conflicting with advice in paragraph 58 of the National Planning Policy Framework. The proposal would also conflict with policy 5 of the Cornwall Local Plan Strategic Policies 2010-2030 Pre-submission document March 2013, which indicates that development should be well integrated into its environment and policy GD-1 of the Penwith Local Plan (2004) which indicates that development should integrated with its surroundings in terms of scale, siting and design. If the applicant is aggrieved by the decision of the local planning authority to refuse permission for the proposed development or to grant it subject to conditions, then they may appeal to the Secretary of State under section 78 of the Town and Country Planning Act 1990. If you want to appeal, then you must do so within 6 months of the date of this notice (or 12 weeks from the date of this notice in the case of householder appeals made in relation to applications submitted on or after 6 April 2009). Appeals must be made using a form which you can get from the Planning Inspectorate at Temple Quay House, 2 The Square, Temple Quay, Bristol BS1 6PN or online at www.planningportal.gov.uk/pcs. The Secretary of State can allow a longer period for giving notice of an appeal, but he will not normally be prepared to use this power unless there are special circumstances which excuse the delay in giving notice of appeal. The Secretary of State need not consider an appeal if it seems to him that the local planning authority could not have granted planning permission for the proposed development or could not have granted it without the conditions they imposed, having regard to the statutory requirements, to the provisions of any development order and to any directions given under a development order. In practice, the Secretary of State does not refuse to consider appeals solely because the local planning authority based their decision on a direction given by him. If either the local planning authority or the Secretary of State refuses permission to develop land or grants it subject to conditions, the owner may claim that he can neither put the land to a reasonably beneficial use in its existing state nor render the land capable of a reasonably beneficial use by the carrying out of any development which has been or would be permitted. In these circumstances, the owner may serve a purchase notice on Cornwall Council. This notice will require the Council to purchase his interest in the land in accordance with the provisions of Part VI of the Town and Country Planning Act 1990. If this is a decision on a planning application relating to the same or substantially the same land and development as is already the subject of an enforcement notice, if you want to appeal against your local planning authority’s decision on your application, then you must do so within 28 days of the date of this notice. If an enforcement notice is served relating to the same or substantially the same land and development as in your application and if you want to appeal against your local planning authority’s decision on your application, then you must do so within 28 days of the date of service of the enforcement notice. Submitted by Angarrack.info ... on Tue, 29/10/2013 - 15:29. Submitted by Angarrack.info ... on Fri, 18/10/2013 - 12:17. The documents tab at the top of the page may show details of the response received. However for historical planning applications not all cases have electronic documents available to view. Parking numbers are relatively low for B1 use, I would recommend consideration is given to increasing the numbers of spaces. Hayle Town Council strongly objects to this application on the following grounds:- 1. This site is designated under the Penwith Local plan, Policy TV2, as Open Area Related to Settlements ' to maintain an important break in development and the village, to safeguard the separate identity of Angarack. These industrial units would create an unwelcome intrusion into the open area and possibly open the door to further intrusion and the eventual loss of the open area. 2. The proposal does not accord with the National Planning Policy Framework, in that it does not respond to local character or establish or maintain a sense of place or reflect the identity of local surroundings. 3. Early work on the Hayle Town Framework has discounted this site and there is little support locally for its development. 4. The Council believes there are empty units on existing local industrial estates and the applicant has not demonstrated a clear demand for additional units. 5. The plans do not appear to show how the development would be screened from the village which is about 200 metres away. Submitted by Angarrack.info ... on Fri, 04/10/2013 - 19:41. I wish to register my objection to the Planning Application PA13/06605 for the construction of two industrial units on Marsh Lane/Grist Lane TR27 5HZ. The proposed site would totally negate the existing green buffer zone which provides the only separation for the village from industrial estate the ever increasing traffic using the estate. We already have high incidences of congestion caused by the estate and retail park with traffic often backing up to the main A30 roundabout, blocking access and exit from the village at that end of the road and resulting in the village being used to bypass the problem. Furthermore, this development would require access from Grist Lane bringing yet more commercial traffic even nearer and into the village. All three roads in and out of Angarrack are seriously affected by increased traffic and are only single track roads with some dangerous blind bends, steep hills and very few places to pass. This is a significant problem for cars, more so for lorries and totally unacceptable for the village itself. Vacant industrial units are currently plentiful in and around Hayle and this further development can only hinder the prospects of ever utilising them and will be unwarranted further encroachment on the village. As a resident of Angarrack, I object strongly to any further extension of the industrial park towards the village. With both retail and industrial development proceeding apace on both sides of Grist Lane, residents of our quiet and peaceful village are feeling increasingly besieged. A green field buffer must be retained or the character of Angarrack will be destroyed irreparably. I am writing to Object to the above planning of two industrial units on Grist Lane. As a resident in Angarrack I feel that this area is the only green field that will be left between the village and the new proposed development. If this field was to be built upon it would mean that the whole drive into the village would be through a built up area and would also increase the flow of traffic, something I would not be happy with, hence this email. Please register my objection to the building of these two industrial units at grist lane -this is the only green field on that side of the road separating angarrack from the industrial estate-nobody would want to drive through an industrial estate to get home. I strongly object to the proposed erection of 2 new industrial units. They will infringe on the buffer zone between the industrial estate and Angarrack. The traffic frequently backs up the A30 roundabout and connecting roads already due to the high volume of traffic in and out of the Rugby Club, the Retail Park and Industrial Estate; new units will only add to the existing problem. Car transporters often partially block Marsh Lane because they cannot access the industrial estate due to shoppers and staff parking there from the Retail Park because of limited parking. This begs the question, more units, more deliveries which have to be loaded/unloaded on the road thus blocking access to Angarrack further? And is there really a demand for new units at Marsh Lane when a mile away, at Guilford Industrial Estate some units are unoccupied?? We wish to object to the above application for the erection of 2 industrial units because: 1. They are outside the present industrial estate at Marsh Lane. 2. They would infringe the open space/ buffer zone between the industrial estate and the village of Angarrack. 3. The roads/roundabouts leading to the industrial estate do not lend themselves to an increase in traffic since there is already a problem in peak periods especially with the flow of traffic to the current retail park and industrial estate causing traffic to back up on the A30. Car transporters to the existing two car sales businesses there are unable to load/offload without parking on the verge by the roundabout at the rugby club due to the traffic and parking on the industrial estate (caused partly by their not being enough spaces in the retail park). I object to this proposal. It will mean further encroachment into the 'green barrier' between Angarrack, where I live, and the industrial estate. I feel we need some sort of agreed 'protected area' to prevent the industrial estate from building all the way up to the village. The traffic going into the Retail Park and Industrial Estate is already a problem and, as Grist Lane is narrow, this will only get worse if the Industrial Estate gets any bigger. I live very close to the proposed development site and I am requesting that Cornwall Council refuse this planning application as the proposed development will continue the gradual ?creep? of the Industrial Estate towards Angarrack village, further reducing the green barrier that currently exists between the two. If this proposal is allowed it will set a precedent that will allow further expansion of the Industrial Estate until it actually reaches Angarrack itself. These proposed new units will also increase the volume of traffic using Grist Lane and Marsh Lane. I understand that there has been planning for two industrial units PA13/06605 in the buffer zone at Angarrack ,I am objecting to these units as they are encroaching on the green and natural surrounds of the village.and fear once passed there will be no limit on plans for future developments being passed . I object to this proposal. It will mean further encroachment into the 'green barrier' between Angarrack, where I live, and the industrial estate. There needs to be a 'protected area' to prevent the industrial estate from building all the way up to the village. The traffic going into the Retail Park and Industrial Estate is already a problem and, as Grist Lane is narrow, this will only get worse if the Industrial Estate gets any bigger. This proposed development is outside of the industrial estate and infringes the open space (buffer zone) between the estate and Angarrack. I therefore object to this development. In addition it should be noted that the last construction has resulted in the part of the hedge being replaced by a "shoddy" looking brick wall that appears to extend beyond the original hedge line. This is unacceptable. I am requesting that the application for the proposed construction of 2 industrial units be rejected due to the fact that they will be far too close to our lovely picturesque village. The industrial units will infringe the open space between them and us in the village affecting the wildlife and the noise level. These new units are creeping too far into the village causing spoilt views and extra traffic. What with the new retail park coming, it will change the tranquil and peaceful feel of Angarrack. Already enough units in Marsh Lane without more being built. Getting too close to village causing concern for the environment. I object very strongly to this overdevelopment. The Penwith Plan identified that Angarrack should be protected from amalgamation into Hayle - this is not happening and it needs to. Angarrack is a historic village - several hundred years older than Hayle itself and Marsh Lane has already been subject to the most unsympathetic planning with half the hedgerow between Angarrack and Hayle being entirely lost (much replaced with 'stone walling' which is sprayed with weedkiller on a frequent basis destroying wildlife amenity and causing dangers to passing wildlife, people and dogs) and over a third of what remains degraded - as was remarked upon by the wildlife specialists at the recent exhibition for the other side of the road. What was just a few years ago a quiet lane approaching the village is being widened and tamed such that it has almost completely lost its character - it is vital that what remains is preserved. The Industrial Estate development is out of control and no further increase can surely be approved until the existing issues have been resolved. As well as traffic - in particular the enormous car transporters which are wholly out of place a few hundred yards from a village, the state of the hedges are appalling and getting worse by the day. In one place the Industrial Estate has already broken through an ancient hedge - which are supposed to have statutory protection (being vitally important for bats and bees), destroying the hedge and bank and causing nuisance to people attempting to use the road, in other places the ancient hedge has been replaced with eucalyptus and leylandii completely changing the character and wildlife value of the hedge, in other places the viability of the hedge is in danger as it has been undercut and no enforcement measures seem to take place. Ratrunning through Angarrack has already been identified as a serious issue resulting in the deployment of special signage to try to allay the problem. The Retail Park and Industrial Park produce traffic which the small roundabout at the Rugby Club is already unable to cope with - more traffic will be impossible. Gridlock at that roundabout and to the A30 is already frequent and will only get worse - exacerbated by the failure to provide simple Car Park Full signs for the Retail Park as well as the underprovision of parking. Emergency vehicle access to the village is at risk which, with much of the village being in an acknowledged flood plain, is at best reckless. The level of parking on the access roads into the Industrial Estate is both hazardous and unsightly. In addition there has been no demand demonstrated for further units - there are vacancies in the existing Industrial Parks. Indeed what appears to be happening is that the other parks are simply moving to the Marsh Lane Industrial Estate. I wish to object to planning reference PA13/06605, as it will infringe on the buffer zone between the industrial estate and Angarrack, also the road is too narrow for any increase in traffic, and will add to the existing problem on the A30 roundabout. I would like to strongly object to the above planning application. My main reason for this objection is the infringement on the open space or buffer zone between Hayle and Angarrack. Hayle is coming ever closer to our village and if we allow any more development, Angarrack will no longer be the peaceful village it is. Another consideration is even more traffic using Grist Lane and Marsh Lane, which is barely more than a single track road, especially when hedgerows grow during the summer. Besides this, any new development will put more pressure on the A30 roundabout, again especially in the summer months and other busy times. Attempting to enter or leave the village during these times is an absolute nightmare. There are numerous reasons to object to this proposal. The traffic around the surrounding area already poses a problem, during peak times and in the summer the traffic already backs up at the main Hayle round about due to the high volume of traffic from the comparatively small shopping centre already present. There is no doubt that people will use Angarrack as a cut through if the plan went ahead. This is a single lane road in many places and is not suitable for this volume of traffic. What about the impact on local businesses, many already struggle and we are supposed to support our local community. The buffer zone between Angarrack and the already present industrial estates needs to remain as just that and should not be encroached on, Angarrack is, and should remain a village, the pretty village that people know it as! The location is not suitable for a development of such a size and not necessary either. Both Guilford and Marsh Lane industrial estates have vacant lots, how Will this help this situation, simple, it won't. I write with reference to the planning application number PA13/06605 and would like to object to the proposal for the following reasons: The industrial units are too close a proximity to the village of Angarrack. I feel that if the units are put here, it will infringe on the open space between Angarrack and Hayle. I hope you are able to take my views into consideration when deciding on granting/refusing the planning proposal. This application will erode the green buffer which keeps Angarrack separate from Industry/retail parks. The traffic problem will also become even worse than it is. I am writing to object to the Planning Application PA13/06605 for the construction of two industrial units on Marsh Lane/Grist Lane TR27 5HZ This proposed development would encroach onto the green buffer zone retained for the village. The buildings would add to the rain water run off issues and strain on the sewage system already experienced by the village. The necessity for more industrial units is not evident as there are vacant units on the Hayle industrial park, Guildford Road industrial Park (which has just lost Massey Ferguson as a tenant) and this is before the development on Hayle quay so it would seem unwarranted and surplus to requirements to build on a green field site whilst brown field opportunities are available. The current traffic congestion on the A30 roundabout creates a backlog of traffic to Camborne in the summer or when sales occur at the retail park. In addition, the car boot sale at the Rugby club on Sunday?s creates a stream of traffic which wraps dangerously around the A30 island causing traffic to weave around stationary cars in order to exit onto the A30 going towards Camborne. The additional congestion from the industrial park entrance and mini island (and any backlog to the A30 island) could prevent emergency vehicles reaching the village promptly which is a worry. The impact of the slow traffic and build up of traffic queues on the A30 island already creates queues attempting to enter the island from McDonalds or exit from the Costa coffee exit, leading to an increased traffic flow back into the village, on Angarrack Lane, Steamers Hill and Hatches Hill. These are single track roads with few passing places, not meant for the volume of traffic now using them as a ?rat run?. The entrance span from Riverside (a lane) onto Hatches Hill is quite blind and inadequate and dangerous to exit given the increased traffic flow and the speed of the shopper and commuter (non-village) traffic. Further development lower down on Grist Lane and Marsh Lane would exacerbate this. In summary a poorly conceived proposal, in the wrong place and with no evidence of a need in Hayle for more industrial space which could rob any existing vacant units of a potential tenant due to over supply. I am writing to object to the Planning Application PA13/06605 for the construction of two industrial units on Marsh Lane/Grist Lane TR27 5HZ. Some Industrial Units have already been built on the original Green buffer zone between Angarrack and the industrial estate, and the ' buffer zone' now is so narrow that no further development should be permitted. The once quiet and special village of Angarrack is being swallowed up by Hayle's ugly Industrial Units. My other concern is the increase in traffic flow. I moved to Angarrack as it had easy access to the A30, but now it is almost impossible to get out onto the A30, due to the increased volume of traffic using Marsh Lane and Grist Lane. There is often an obstruction in the road, of a huge car transporter delivering vehicles to the Car showrooms, and queues of traffic, blocking the roundabout, trying to get into Marks and Spencer and Next shops. More units will necessarily increase traffic volumes, and create more chaos. The large A30 roundabout is already very busy, and many accidents have occurred here. I therefore urge you to reject the above planning application. Submitted by Angarrack.info ... on Fri, 04/10/2013 - 17:55. 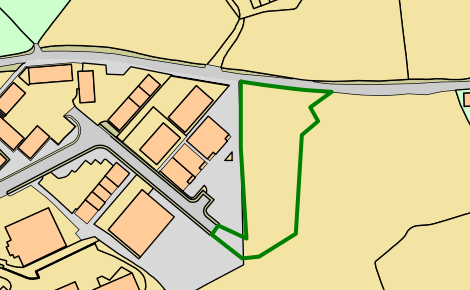 A planning application has been submitted to Cornwall Council for the construction of two industrial units adjacent to the existing industrial estate/business park on marsh Lane. The number of the application is PA13/06605 (in the "Cornishman" 19/09/13) and you can find details on the Cornwall Council website. Look in the online planning register and type in the number. Please seriously consider objecting to this application, as the proposed development is outside the industrial estate and infringes the open space (buffer zone) between the estate and Angarrack. On this occasion there is not much point in sending a copy of your letter or e-mail to Hayle Council, as on Thursday 19th September they strongly recommended it for refusal. However, that is not enough - we need individual objections to Cornwall Council too, lots of them. I think you can either view and make comments on the website at http://planning.cornwall.gov.uk/online-applications/applicationDetails.d... or you can e-mail them to the relevant planning office (planning@cornwall.gov.uk) (Mention Case Officer Phil Brookes) or write to (I think it is): Planning and Regeneration, Cornwall Council, Dolcoath Avenue, Camborne, Cornwall TR14 8SX. Please with all of these, include name and address. They cannot accept anonymous comments. Remember to include application number and (if objecting) to use the word "object". It would be tremendous if everyone in your household qualified to comment could do so. Closing date for comments: 9th October 2013.